Very good conditions for the 10km in Hollymount (what a contrast to the prior year). I took it out fairly hard and to my surprise nobody went with me. I’d opened up a lead in the first km and then it was into the old time trial mode to which I’m well used to. The multiple laps are tough mentally but I knew the gap behind was opening up but you can never relax when you have John Byrne hunting you down. I felt pretty comfortable throughout – certainly not redline as the heart rate analysis afterwards showed. I crossed the line in 33:15 for the win so at least that’s a step in the right direction. 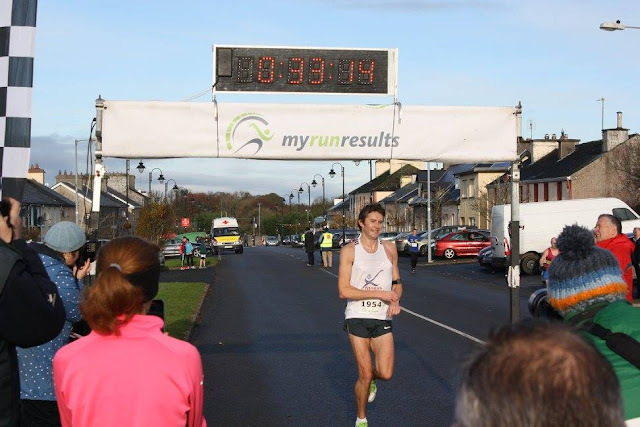 Next step is to get back into the 32’s then maybe one more sub 32 in the auld legs. Who knows….